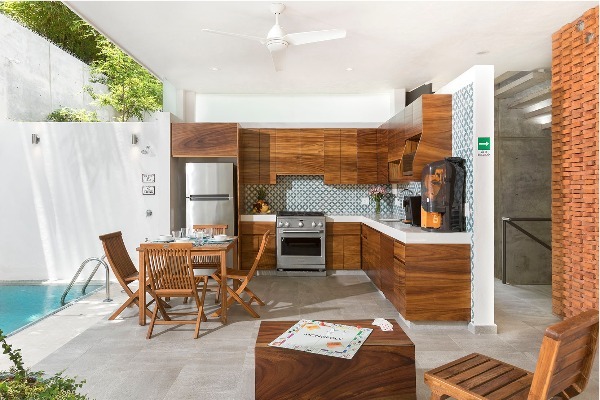 Sundaram Suites, a new vacation rental in San Pancho, Nayarit, is just a ten minute drive away from our town of Sayulita. With a prime jungle location, one block from the beach, luxurious accommodations, and conscientious and caring staff, Sundaram Suites seems to be an excellent choice when deciding where to stay on your next vacation to the area. This rental is unique not only in its design, but that it is for adults only, with a minimum stay of six nights. I talk with Abraham and Felipe, the owners and operators of Sundaram Suites about their dedication and vision for their vacation rental. It is very clear that that the two not only have extensive experience and expertise in the hospitality industry, but that they are passionate about the work they do in helping curate the perfect vacation for their guests. Why did you (Abraham) and Felipe decide to open/create your vacation rental, Sundaram suites, in San Pancho? Both of us are hoteliers by major in college. We always dreamed of having a small facility to be able to have contact with people from all over the world. 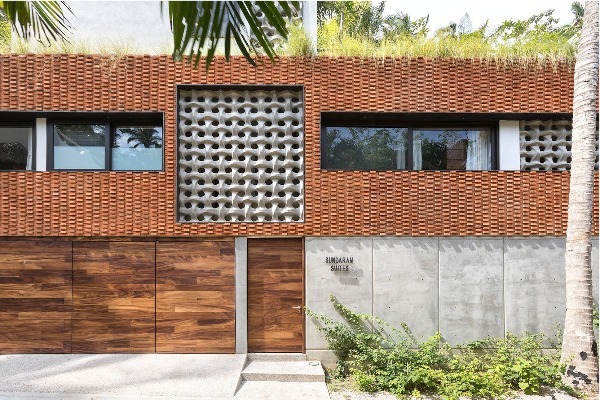 This idea came to life when we moved to San Pancho permanently and decided to build our home in this piece of paradise where the beach meets the jungle. San Pancho is the perfect place to relax and float, enjoy the tropical weather, and enjoy its people, waves, scenery…. it is just perfect in every way! So here it is, our long time dream, now alive and running right next to our house! Besides studying hotel management in college, what is your experience in hotel management / hospitality? After graduation in hotel school at the University Of Nevada, Las Vegas, we moved to San Diego, CA. There, both of us worked in the industry right away. Abraham started as a waiter in a restaurant, and moved his way up to become the general manager of a very successful long-stay suites hotel. Felipe started as a management trainee in one of the oldest and best hotels in San Diego, and he quickly moved up the ladder to become an executive. Both of us have excellent experience in dealing with all aspects of the hospitality industry. When we moved to Lima, Peru (Abraham was born and raised in Lima, Peru), where we lived for seven years, we invested in high-end condos. We renovated them and made them very appealing. We rented to general managers and CEOs of international companies, as well as ambassadors from all over the world that came to work in Peru. We did the same in Ecuador when we lived there (Felipe was born and raised in Quito, Ecuador). Although these properties are rented long term, they still demand our hospitality experience, which paid off big time! What do you love the most about the or kind of work that you do? Why is it a passion of yours? We love to make people feel comfortable, happy, and make them realize that their money is well spent. Our passion is perfection; yes this is a bit general, but it is true. Everything we do tends to arrive to perfection. Even in our lives, we give and expect only excellence. Sundaram Suites have very high standards, not only in their finishes and in the making, but also in the services we offer, as well as in the training we give to our staff. We strive to help people have the best time-off every time they visit us, by enjoying their precious relaxing moments, listening the sound of the waves, or the sounds of the various birds that visits us all year long. A few years back, Felipe decided to change careers and got a degree in Interior Design. 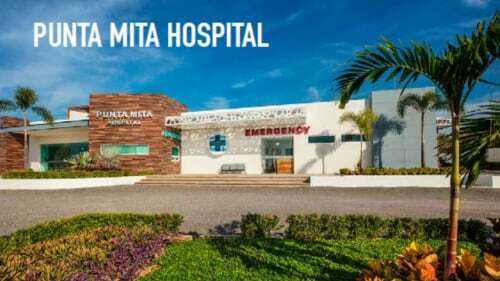 He started his private practice in San Diego, which became very successful. Abraham also changed careers, and went into finance. When we did this, suddenly a perfect synergy was created. The team of great interior design taste and strict managerial and financial practices, mixed with our already developed hospitality experience, helped to create a very successful and sought-after brand. How would you describe the concept or design of Sundaram Suites? What makes it unique from other rental properties? Sundaram Suites have a very contemporary design. 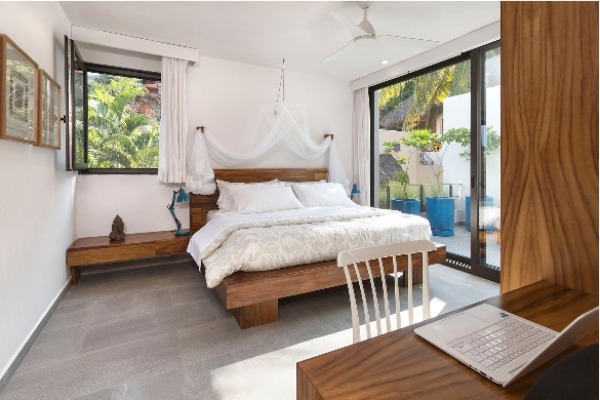 The suites have very clean lines, ample spaces, tall ceilings, and quiet elements of design that turn the space into a very serene, zen, tranquil home. We used the best materials to create an organic construction, and the latest technology to make it work perfectly and as green as possible. 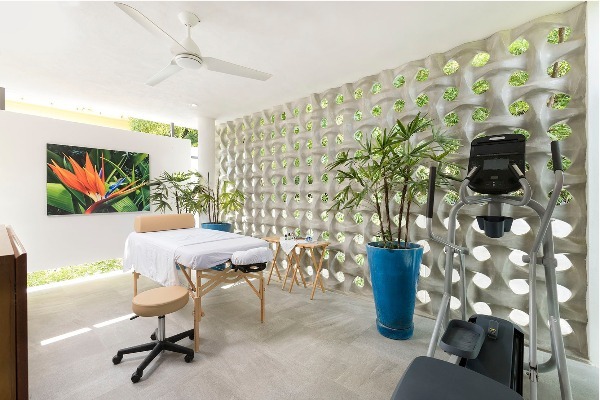 Our space even has a private spa where you can get massages, exercise, and coming soon, can get facials or simply open a yoga mat, stretch, and enjoy the sounds of the jungle and the waves from the beach. Furthermore, Sundaram is set apart from the rest because it is walking distance to the beach, literally, and offers great services. We have a state of the art six step water filtration system, including ultraviolet lights for the entire property, solar panels to produce our own electricity, a saltwater pool, a fully equipped gourmet kitchen to be able to enjoy breakfast (which is provided) along with great local cuisine, a golf cart to drive to town, and your own private en-suite mini fridge, among many other amenities. The Suites are also owner operated and managed. We do not use outside management services. How do you want guests to feel when they stay at Sundaram Suites? At home, but a home that is only dreamed about. Peaceful, serene, beautiful, luxurious, stunning, easy going, where awesome experiences just happen without any planning. We want our guests to let their senses do the work, and to venture out to go beyond. We want to provide them with all the necessary tools to do so. 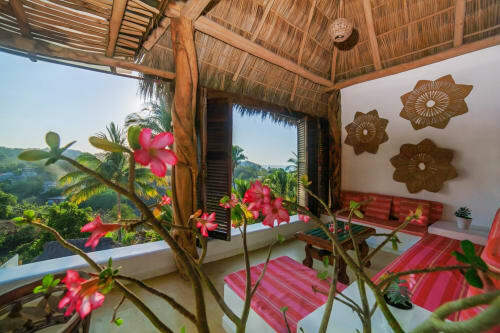 Guests can rent both suites, allowing them to have the entire mini-villa for their own. They can also rent a car if desired and keep it inside the garage. We offer boogie boards, beach equipment, and all kinds of games to enjoy great moments together. You can hire a private chef (we know a few) to cook a romantic dinner under the stars. Also, you can hire a private driver (we have some to recommend) to drive you to the close-by towns, including Sayulita and Puerto Vallarta. There are also quite a few outdoor activities that we can help arrange for you, if you feel adventurous, such as playing with dolphins, horseback riding, bird or whale watching.